You can get a $100,000 grant if you “want to build new things,” are 22 or younger, and not a student. In fact, you are required to drop out of school. According to a new study, there is just one problem. Mr. Thiel might have been targeting the wrong age group. Because Mark Zuckerberg or Steve Jobs would be in that second group, we could assume that highly successful entrepreneurs are in their twenties. Less constrained by the past, twenty-year-olds could be more innovative. They also might have fewer family distractions and more energy. 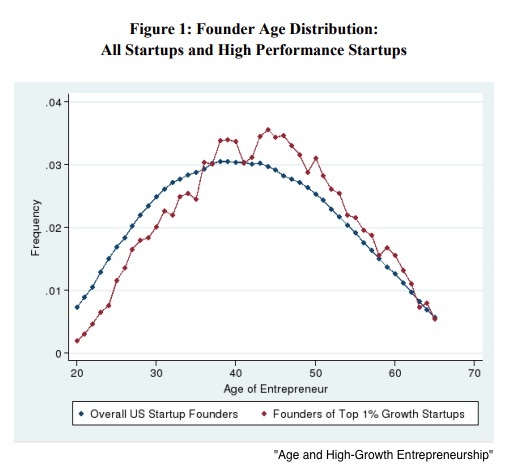 Using a massive data base, a new NBER study concludes that highly successful entrepreneurs are usually much older when they start their businesses. Equipped with extra years of learning, they accumulate more human, financial, and social capital. The result? The past becomes an entrepreneurial springboard. As an economist who described the impact of highly successful entrepreneurs, Joseph Schumpeter (1883-1950) explained how they upset the status quo. Calling the process creative destruction, he told us that old industries undergo a painful demise as newer entities nudge them out of existence. And we can wonder whether the Thiel Fellowship should be offered to midlife thinkers. My sources and more: In my monthly NBER Digest, this paper grabbed my attention. Only a beginning, the paper led me to the Thiel Fellowship website.